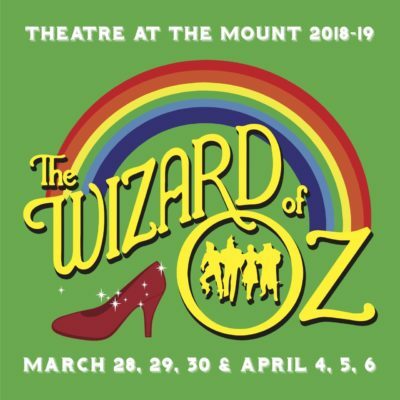 RANCHO PENASQUITOS–Theatre at the Mount’s 2018-2019 season continues March 28 thru April 6 with the beloved family musical adventure,” The Wizard of Oz” at the Performing Arts Center at Mt. Carmel High School. Ricardo Valenzuela serves as director and choreographer of the classic story, bringing the iconic and familiar MGM motion picture to life while infusing the production with new stage innovations. The production includes musical direction by Marti Martinez and animated projections developed by Bill Harris and the 3D Animation class at Mt. Carmel High School. Included among the cast of over 70 actors are elementary students from Morning Creek and Sunset Hills. Mt. Carmel High School senior Rachel Wilson plays Dorothy Gale. Sophomores Finn Proctor and Jonathan McCall, and Junior Gregory Martinez will play the Scarecrow, Tinman, and the Cowardly Lion, respectively. Junior Melanie Athans will play Glinda the Good Witch of the North, Junior Aleks Pluth as the Wizard of Oz, and Seniors Andalyn Honselaar and Naomi Melville share the role of the Wicked Witch of the West. This production is based on the 1987 version by John Kane who adapted the film’s screenplay for the Royal Shakespeare Company. The Performing Arts Center at Mt. Carmel High School is located at 9550 Carmel Mountain Road in Rancho Penasquitos. For more information, visit www.mchsdrama.com.